CORSAIR just recently launched their brand new Vengeance Pro series kits. These are designed to set new levels in value and overclocking. With a new stylish and aggressive looking heat spreader design, available in four different flavors: Blue, Gold Red and Silver color. The current products range up from 8GB to a whopping 64GB kit. The rated speeds start of at 1600MHz up to 2933MHz for the flagship version; especially the high end versions are being optimized for Intel's 4th generation Haswell processors. At Computex 2013, CORSAIR already showed higher specced versions, though if these will ever hit the shelves remains a big question. 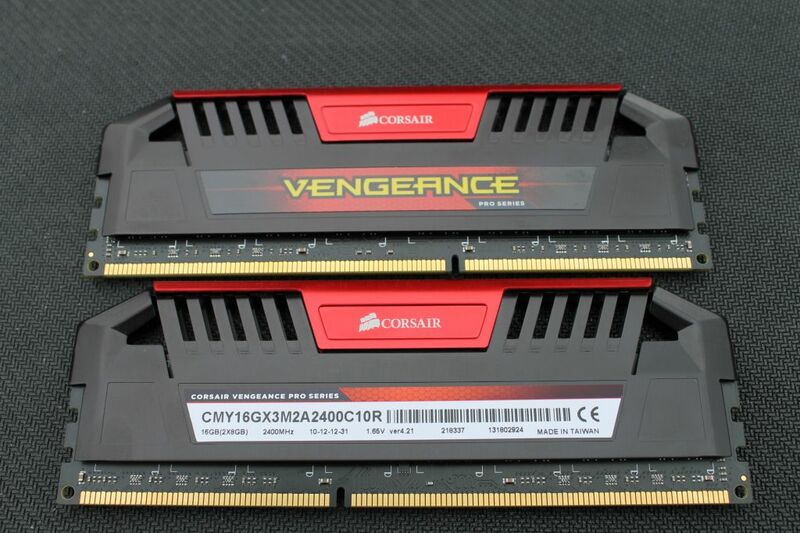 The today's reviewed Vengeance Pro kit is one of the more enthusiast targeted kits, comprising out of two 8GB 2400MHz Cas 10 DIMMs, with a red accent finish. 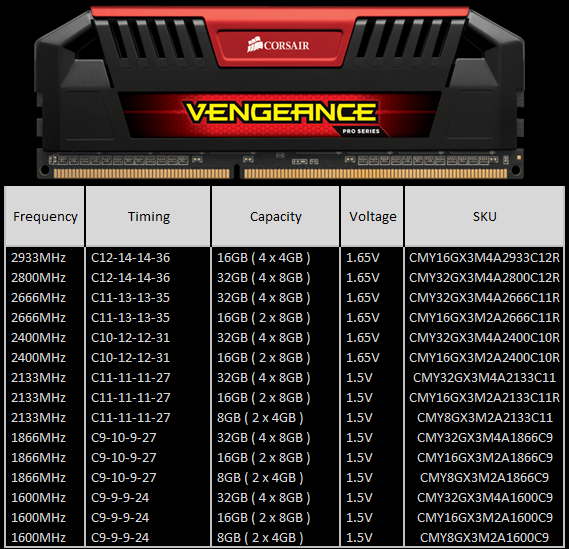 CORSAIR, a worldwide designer of high-perform­­­­­­ance components to the PC hardware market, announced the CORSAIR VENGEANCE PRO DDR3 Memory for PC overclockers, enthusiasts, and system builders. Available initially in capacities up to 64GB and speeds up to 2933MHz, the Vengeance Pro Series memory modules are designed to set new levels of value and overclocking performance with the 4th generation Intel® Core™ processor family (codenamed Haswell) and previous generation Intel and AMD platforms. Vengeance Pro Series memory modules are built with eight-layer PCBs and RAM ICs specially selected for speed and overclocking headroom, and like all Vengeance memory, incorporate XMP 1.3 profiles allow for automatic, reliable overclocking. The memory kits are designed with new aggressively styled, aluminum heat spreaders for superior cooling. The memory kits are available in black with silver, red, blue, or gold accents to enable enthusiasts, gamers, and modders to customize the look of their PCs. Vengeance Pro Series memory is designed to deliver class-leading value and are backed by a life-time limited warranty. An optional Vengeance Pro Airflow fan is available for superior thermal performance at high memory clock speeds. Our sample kit comprises out of two high quantity 8GB DIMMs running at 2400MHz, right in between the mainstream and high speed versions. As you see more then enough choice to satisfy the need of the budget minded, till the craving desire for speed with the high end 2933MHz specced model. The announced 64GB models are not listed yet.